At least 26 civilians have been killed and over 40 wounded after Afghan army mortar rockets targeted a wedding party in southern Helmand. Most of the victims are believed to be women and children. The tragedy happened in a village in Sangin district, which was targeted by artillery fire from three directions, General Mahmoud, deputy commander of the Afghan 215 Corps in the province, told Reuters. "What we know so far is that our soldiers fired mortar rounds from three outposts but we do not know whether it was intentional," the official said. "We have launched our investigation and will punish those who did this." The attack left 26 people killed and wounded 41 others, deputy provincial police chief Gul Pasha Bakhtiar told the news agency. A cousin of the bride, Abdul Haleem, who was hosting her wedding, said that nine of his children were missing after the rocket struck his house. "Nine children of mine are missing; I just collected body parts," he told AP. "I don't know whether it's my children or someone else." Hundreds of guests attended the wedding ceremony. The year 2014 was the deadliest of the war in Afghanistan – both for government forces and civilians – with around 5,000 Afghan soldiers and police killed. Meanwhile the number of deaths and injuries among civilians has reached an estimated 10,000 people since the UN started keeping figures in 2008. 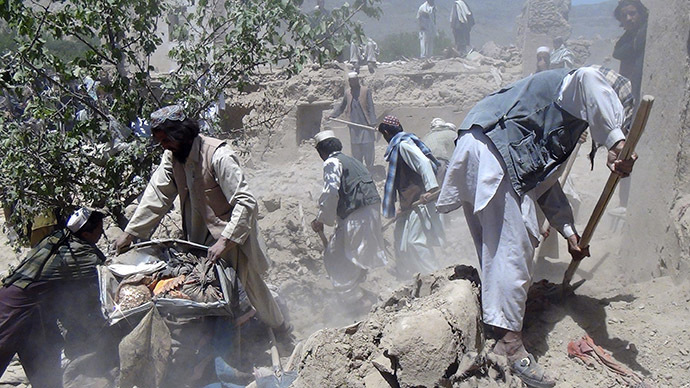 Last year was also the first when the civilian death toll from direct battles between Taliban and Afghan military surpassed that claimed by roadside bombs, marking the escalating violence in the country.